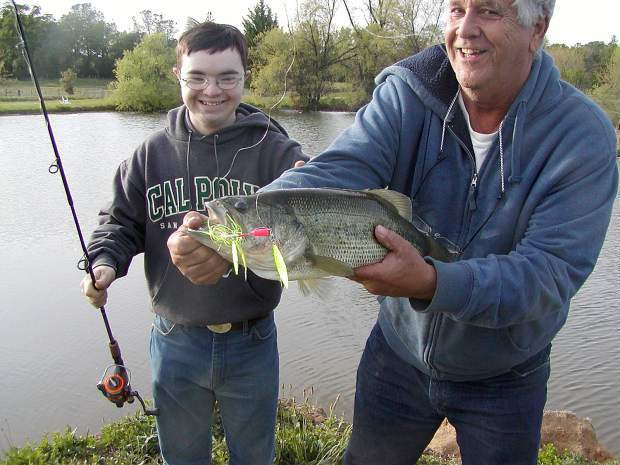 Tom Moreno and Collin meet "Mobey Bass" in person before returning him back into the water. There are a few ways to think of the term sport. Team sports come to mind for most people. Our first experience is often in school with kickball, soccer, baseball, etc. Many students gravitate to the organized team sports and have a gift for them. But there are many who seem to get picked last when choosing up sides and do not excel at the games. I was one of the latter. I tended to do things on my own and did not gravitate to groups. I was fortunate to have a grandfather who was an angler. He introduced me to another view of the term sport that could be enjoyed by yourself or in the company of others. You were not carried along by a team. In my way of thinking, you are challenging yourself to a lifelong mastering of skills. The fish are the ones who confirm that you figured it out and had learned the physical skills. Fishing does not require others to make teams and in a sense there are no conflicts about the rules and whether or not you were out. Now, it is possible to take fishing into the human competitive realm. On party boats, there is the wagering for first, largest, and most. Professional bass fishing has commercialized the sport with sponsors, big money and televised drama. But for me, it is an individual pursuit that can be shared with others but is not dependent on them. Twenty-one years ago this week, my son was born. As he grew up we tried the team sport route. We did some Tee Ball and then the Special Ed basketball and baseball, but it never seemed to click with him. On the other hand, he was always up to go fishing. Early on, the entire family took turns trying to teach him how to cast a Zebco push button reel, all to no avail. We finally turned the task over to Mr. Dave Potter, Colin's PE teacher. It took an entire school year but Dave Potter succeeded. The problem was he did not have the strength in one thumb to push the button. Mr. Potter taught him to cast two-handed, like swinging a baseball bat. The mantra was "Push hard, swing, let go." Once he passed that hurdle, he wanted to cast his own lure and reel in his own fish. The one thing he refuses to do is touch a fish. He prefers to have others handle that for him. This is still a work in progress. We are fortunate to have permission to fish Tom Moreno's pond not far from our house. We can grab a couple rods and go fish for an hour without turning the trip into a major expedition. This past winter we have had such warm weather that I was getting the "let's go fishing" message frequently. Even though the days were warm, the water was cold, and we often struggled to get a fish to bite. All that turned around about three weeks ago. The bass bite on all of our local lakes took off. The smallmouth bite at Scotts Flat has been good. The spotted bass have been cooperating at Collins, Rollins, and Bullard's Bar. The hottest bite though has been at Tom's pond. Five anglers had caught and released 52 bass in one afternoon last week. The spawn was over and the bass had an appetite. 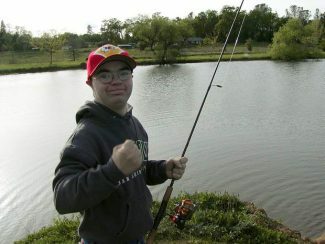 I had planned to take Colin fishing Monday, his birthday. The rainstorm moved in on Sunday and was predicted to last through Tuesday. There was not much I could do but hope things would work out. Monday was breezy with scattered clouds. A rising barometer following a storm is reputed to portend a slow bite. The great bite a few days before might counter balance the barometer theory. The only way to find out was to go fishing. After work we drove over. The wind was stiff but we were not to be put off. 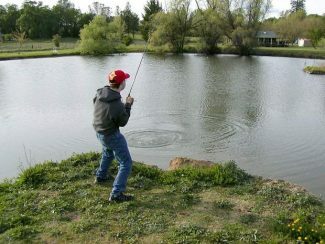 Typically, we work our way around the pond, which can take more than an hour if the bite is good. On the second cast of the day, Colin landed his first fish. We had to work for our fish, one of us hooked up about every 10 minutes. Between the two of us, we landed about a dozen fish in two hours. It really was perfect. We had to work to get a fish, but there were no dry spells long enough to lose focus. Every cast had a good chance to produce. The peak of the trip occurred three quarters of the way around the pond. There is a legendary bass that swims in the pond. He is known as "Mobey Bass." He tips the scales at just over 8 pounds and has been landed twice in the last five years. Colin cast out his spinner bait and as he was reeling it in when his rod bent over and started to throb. I knew it was a big fish when Colin had to adjust his feet to pull back on the rod. He made all the right moves he has seen so many times on those fishing videos that are all but worn out. Luckily, Tom was there with his net or we may not have put Mobey on the bank. I have heard it said that, "It is better to be lucky than good." Colin is lucky, but he is also pretty good. Not a bad combination. On April 6, 2015, a bunch of guys from Duke University won some basketball game in the Midwest. Ten years from now I won't be able to tell you anything about that game, but I will be able to tell you about the third landing of Mobey Bass. Denis Peirce also writes a fishing column for "The Union Newspaper" Outdoors section and is host of "The KNCO Fishing & Outdoor Report" which airs 6 to 7 PM Friday evenings and 5 to 6 AM Saturday mornings on AM 830 radio. You can contact him through his website, www.trollingflies.com. 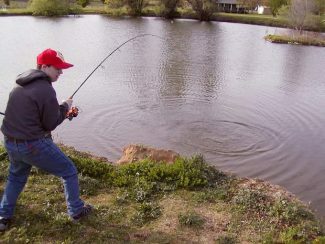 Taking a step back for leverage as he reels in hard, Collin suspects he has caught the "big one!" Almost there, Collin shows patience and determination, a skill set for any sport!